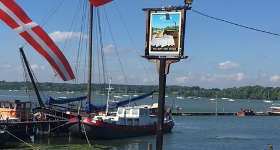 Spend a day or two on the beautiful Pin Mill shoreline, learning to paint and draw with experienced and supportive tutors. "We aim to give aspiring artists the opportunity to experience the pleasure of discovering a special place through the artist's eye, sketching and painting with professional guidance. 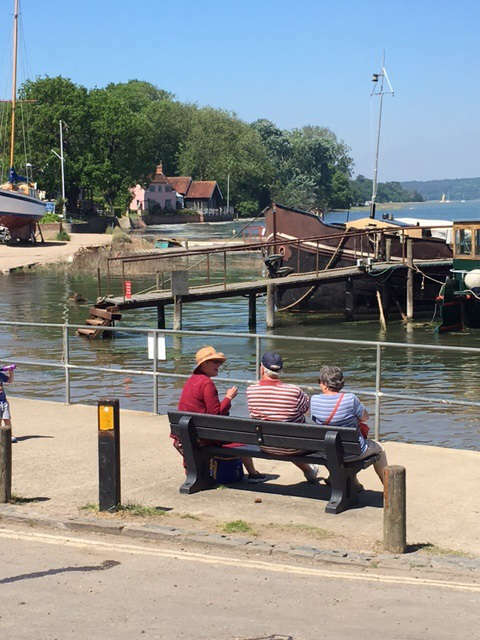 Join us for a combination of convivial company, expert tuition and the chance to develop your skills in a location which has inspired artists for centuries." Come to one or come to both - it's up to you. 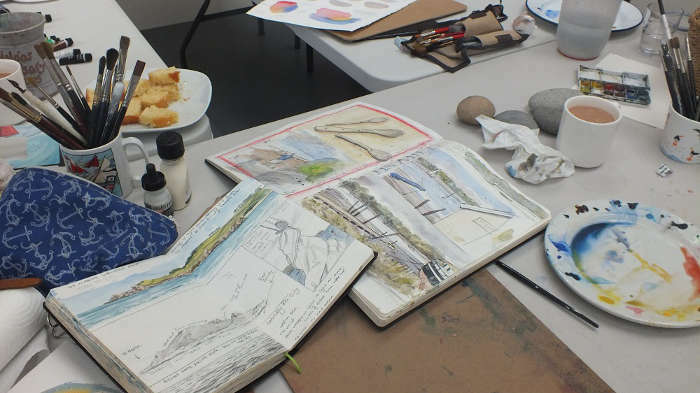 Christine and Claudia will be working together to encourage you to get the best out of your choice of drawing and water based media (watercolours, acrylics, coloured pencils, pens). You will have the chance to try out new techniques and increase your confidence at working on location and in the studio. 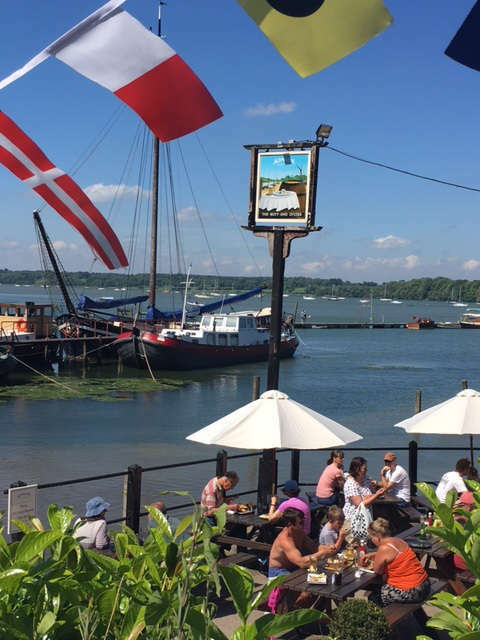 If you'd like to take a midweek break in this lovely corner of Suffolk when the waterfront is a little quieter, come and join us for our two day workshop. 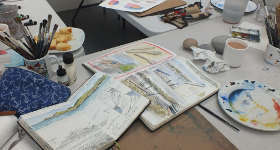 Our courses are suitable for beginners or those who've some experience but feel a bit 'stuck' or lacking in inspiration. 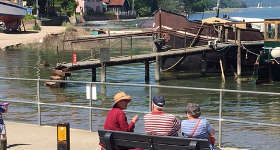 Our base is the Pin Mill Studio, surrounded by a wealth of material to draw - boats, woodlands, marshes, buildings, and an ever changing tidal shoreline. If you are part of a sketching group or art club, or just a group of friends, and you'd like to arrange a day with us, do get in touch. We also do one to one and small group tutorials (including combined art/photography lessons with Anthony Cullen). 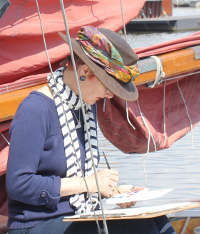 Claudia is an artist and illustrator specialising in marine subjects. She has been teaching adults to draw and paint in watercolours for over 25 years, and aims to make the learning process as much fun as possible. "Though the majority of my professional work is marine based, my teaching methods cover all subjects as I focus on the basic techniques that apply to everything and help you develop your own style. Art is for everyone, not just for artists." 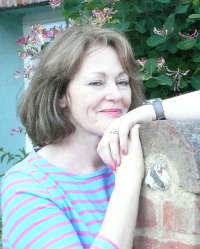 Christine is a professional artist whose passion lies in painting from life. Whether people, animals or inanimate objects, her aim is to express the individuality and sensitivity of portraiture in all her paintings. "After years of teaching art to adults I can’t count the number of times I’ve heard someone say that they’re just getting the hang of painting and wish they had longer. My students find painting so absorbing and love the fact that it is the one time in their busy lives they can switch off and do something they really enjoy." We believe in giving aspiring artists the opportunity to experience the pleasure of discovering a truly special place through the artist’s eye, sketching and painting with professional guidance.